Bringing decades of experience to the electrical systems in your home, Household Electric is equipped to provide troubleshooting, repairs, installations and more! Our workmanship is unmatched and we’ve got a reputation for working quickly and safely to deliver solutions that work. Contact us today for an estimate and let us exceed your highest expectations. For more than 10 years we’ve been the residential electrician for homeowners throughout Clovis, CA have trusted with all of their electrical needs. We’re locally-owned and -operated, allowing us to respond quickly to your service calls and provide work without delay. Count on us to take the time to troubleshoot any electrical problems you’re having, to make sure we’re delivering solutions that work. We’re a fully licensed and insured electrical company, maintaining a superior A+ rating with the Better Business Bureau. From electrical problems, to LED can lighting installations, to rewiring and panel upgrades, we welcome residential projects of all sizes. Just about everything you use in your home runs on electricity—from the overheads lights in each room, to the appliances in your kitchen, to the television you flip on after work. When your home’s electrical system is faulty, out-of-date or needs to be expanded, it’s important to call Household Electric in Clovis, CA. Household Electric will make sure your electrical problems are solved, your wiring is updated and any new installations are up to code. We’ve got decades of experience behind us, along with personal expectations for a job well done that you can always count on. From ceiling fans and LED can lighting, to breaker box upgrades and outlet installations, we’ll be glad to put our abilities to work in your home. As a local electrician in Clovis, CA, we get to work right away on your home’s unique electrical needs. But, that doesn’t mean we just dive in blindly! Our first step is always to troubleshoot and get to the root of the issue—then, once we know exactly what’s needed, we get to work. Our careful, thorough approach helps us work quickly and more effectively, providing your home with solutions that last. We’ll make sure your breakers stop tripping and your new bath fan works perfectly, so you can go about your day without worrying about your electrical. Our dedication to our work will ensure your peace of mind. Lights flickering? Need a new ceiling fan installed? 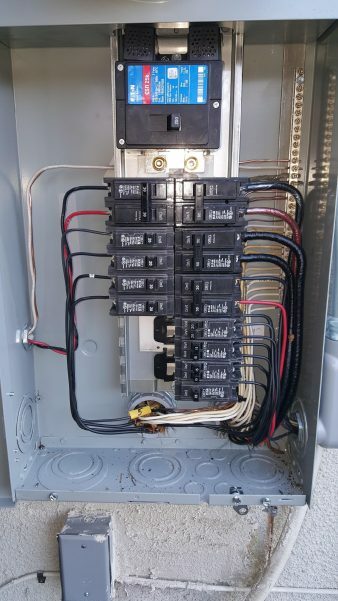 Updating your breaker box? No matter what the job calls for, Household Electric is ready to answer it. Contact us today for an estimate.